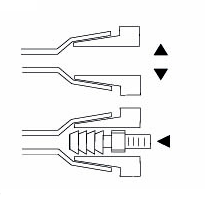 Ninety-degree jaws allow the insertion of a fitting while the tube is expanded. Teflon-coated jaws allow the tube and fitting to slide easily off the Expander as assembly. 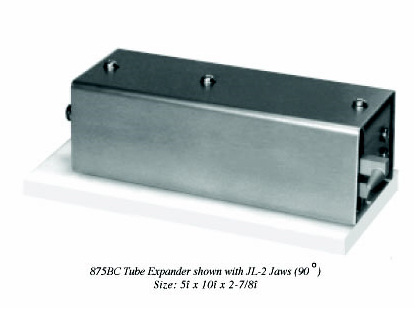 Has the same patented cam/jaw design as our popular 875AC Expander, page 2. Note: How well a tube assembles is a function of tis durometer and material content. After the fitting is assembled, it may take up to 24 hours before full assembly is reached. 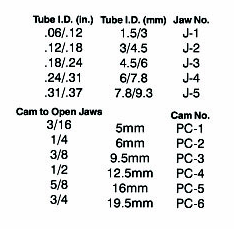 875BC with JL-2 jaw and PC-3 cam - can be used for silicone or similar tubing with an I.D. of .150î and will spread tubing 3/8î.